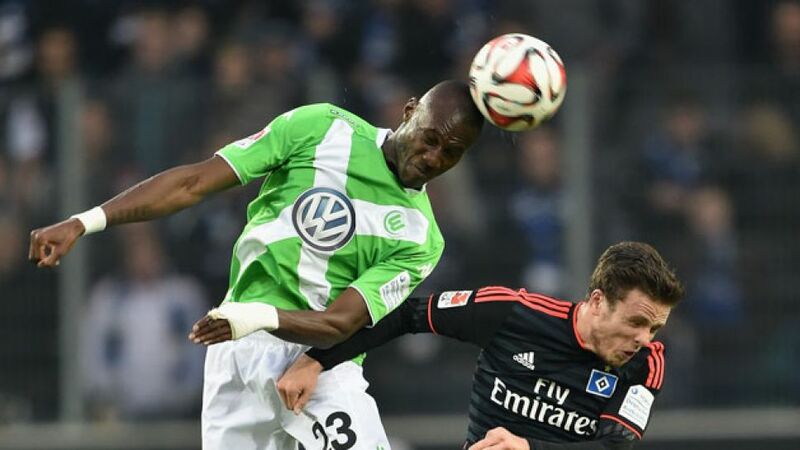 Hamburg - VfL Wolfsburg remain on track for automatic UEFA Champions League qualification after a 2-0 victory away to northern rivals Hamburger SV. Josuha Guilavogui helped the Lower Saxony side to a deserved half-time lead courtesy of his first ever Bundesliga strike, before Daniel Caligiuri crowned a routine win for Dieter Hecking's charges with a well-taken goal after the interval. Without a win in seven, Hamburg started the game full of purpose, dominating possession in the opening stages, although it was the visitors who enjoyed the games’ first chance. Rene Adler in the Hamburg goal did well to keep out Naldo’s header from point-blank range after only three minutes. The Red Shorts were behind minutes later, though, as Bas Dost set up France international Guilavogui who coolly beat Adler to give his side the lead. Boosted by their early goal, Wolfsburg began taking control at the Imtech Arena, repeatedly threatening the Hamburg defence with a number of well-executed counterattacks. Vieirinha could have doubled the Wolves’ lead with a fierce attempt from the edge of the area, while Ricardo Rodriguez’s left-wing cross almost found its way to Bas Dost. Hamburg weren’t without chances of their own, however, former Wolfsburg striker Ivica Olic firing the Red Shorts’ first two attempts wide near the half-hour mark. But it was Dost at the other end who almost doubled Wolfsburg’s advantage when he nodded Caligiuri’s cross over the crossbar, before Vieirinha forced Adler to palm the ball to safety. With goalscoring opportunities proving few and far between at both ends in the early stages of the second half, Hamburg interim head coach Peter Knäbel threw on attackers Nicolai Müller and Maximilian Beister on the hour mark in order to add fresh impetus to his attack. The first second-half chance of note fell to Wolfsburg’s Kevin De Bruyne, however, who skied the ball high over the target from long range. Dost struck the crossbar from an offside position soon afterwards, but the guests added to their lead after 73 minutes when Caligiuri played a fine one-two with Dost and left Adler with no chance to double Wolfsburg’s lead and all but seal the three points for the 2008/09 Bundesliga champions. Substitute Andre Schürrle could have added another for Hecking’s side three minutes from time after beating the Hamburg defence on the break, but it mattered little as the guests cruised to their third consecutive Bundesliga win to maintain their seven-point advantage over third-place Borussia Mönchengladbach, leaving Hamburg deep in trouble in the automatic relegation places.